Few things beat the sugary, rich taste of a dark, sweet cherry. 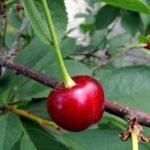 Caring for and maintaining a cherry tree is not too difficult, and you can even get most varieties in dwarf form. 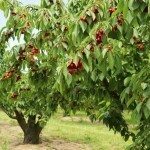 Growing Ulster cherries is a great option if you want an abundant harvest of sweet fruits. Ulster sweet cherries are similar to the popular Bing variety. They are dark, deep red in color and have a very sweet flavor. The variety was created as a cross between Schmidt and Lambert cherries. These cherries are perfect for fresh eating and snacking but also for making wine and juice. The Ulster variety was designed to produce an abundant amount of large, sweet cherries, like Bing, but to be more crack resistant. Cherries tend to crack when they get wet during ripening, but Ulster has good resistance to this phenomenon. It also has decent resistance to drought, diseases, and pests. Ulster cherry trees grow well in zones 5 through 7 and don’t tolerate heat very well. They need a spot with full sun, at least six hours per day. The soil should be well-drained, as cherry trees do not do well with any standing water or soil that is too moist. Ulster will need another sweet cherry tree for pollination purposes. Good choices are Rainier or Royalton. Cherry trees are relatively easy to grow and maintain. With the right conditions, your tree will need yearly pruning in the dormant season and regular watering during the first growing season and then only through very dry periods of weather. Watch for signs of pest or disease, but Ulster cherries have good overall resistance. If your space is limited, choose an Ulster on dwarf rootstock. It will only grow to eight to ten feet (2.5 to 3 m.) tall and about ten feet (3 m.) across. Ulster ripens mid-season. Harvest and eat as soon as possible. To preserve extra cherries, freezing is a good choice.